Gopher, Prairie Dog Underground Rodent Control With Propane And Oxygen. The Rodent Blaster Hot Shot ® is made of all metal construction. 304 stainless steel, 6061 billet aluminum and steel. Built tough for a dirty nasty environment for many years of trouble free use. No plastic here! 100% built and assembled in the USA ! Full 3 Year Warranty. The Rodent Blaster Hot Shot ® eliminates problem rodents that eat, chew and destroy our yards. 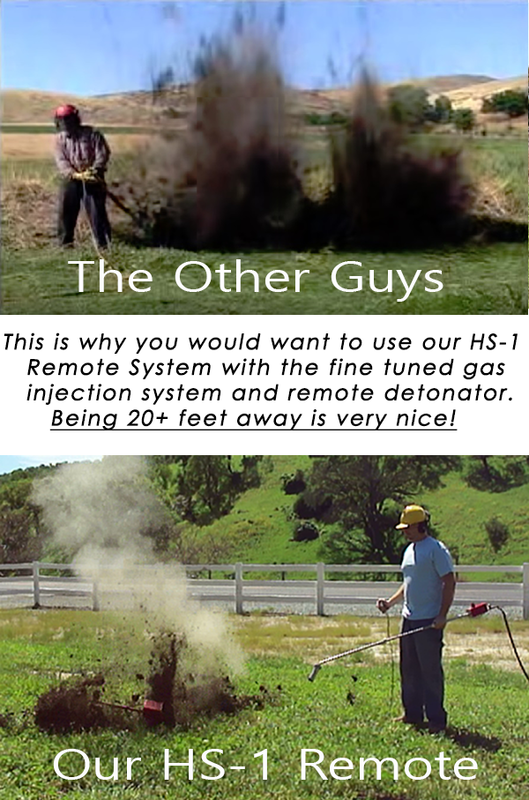 The Blaster Gas Injector injects propane and oxygen, then the Remote Ignition Detonator ignites it with a remote detonating device to exterminate the pests that live in underground tunnels and burrows quickly, safely and humanely without any dangerous poisons or traps. The Rodent Blaster Hot Shot ® uses our specially designed remote detonating system to ignite a propane and oxygen mixture that delivers a 7000 feet per second shock wave that instantly terminates your problem pest inside of their burrow. You won't have any dead rodents to clean up after using our Rodent Blaster. It is safe for the environment and will not harm pets and wildlife unlike dangerous poisons and traps. Why buy the HS1 ? © 2019 by Rodent Blaster. All Rights Reserved.